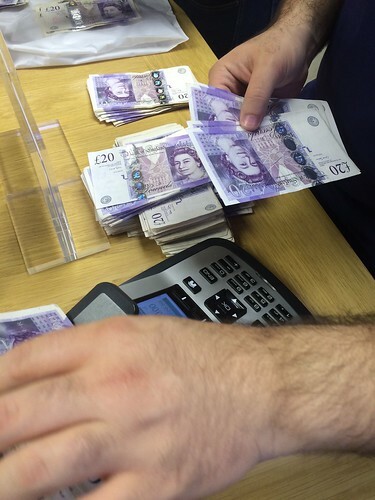 Cash continues to dwindle in the UK, albeit slowly. No-one really needs it any more, except to pay people smugglers, although I suppose it might find a niche amongst hipster nostalgics sort of like vinyl records. I don’t need it to buy stuff in shops since I won’t go to a shop that doesn’t take cards. I don’t even need it to provide a stream of subs to student children, since the requests and the responses all go via PingIt now. Apparently I’m not the only one. Continued growth is also predicted in the Faster Payments Service as more consumers move to online and mobile payments. These payments will more than double over the next 10 years, with 1.9 billion one-off and forward-dated payments forecast to be made in 2025. When you can send money, instantly, from any bank account to any other bank account it’s hard to imagine what you might need cash or cheques for. We have the annoyance of having to give out sort codes and account numbers from time to time, but PingIt and PayM allow us to send money to mobile phone numbers and I imagine that an outcome of Payment UK’s deliberations on payee confirmation may well be the creation of a database of “paynames” (i.e., £dgwbirch) to make casual instant payments even easier. On a typical day, I leave the house with no cash. I buy my bus ticket on my mobile, I use a card at the train station (they still don’t take contactless in the ticket machines) and I use contactless cards or (more usually) mobile to buy coffee and lunch and so on. I’m quite surprised that some shops still go through the pfaff of messing about with cash, especially when I nip in for some milk and the person in front of me is buying a couple of things and paying with a £20 note that means that I have to wait while they have change counted out for them. I don’t know why they bother. Actually, some of them don’t. Healthy high street food chain Tossed has today opened what is thought to be the UK’s first completely cashless restaurant. Two new stores in Central London have been fitted with self-service kiosks, instead of manned tills, taking payment by credit or debit card, contactless, or Apple Pay instead of cash. Waitrose is set to become the UK’s first major supermarket brand to operate a cashless store, where only card and mobile payments are accepted… Five self-service checkouts in the store will accept credit, debit and contactless card payments, as well as mCommerce tools that use near-field communication technology such as Apple Pay. I should explain to our foreign readers that Waitrose is commonly understood to be the most middle-class of all shopping experiences. Yes, well, OK I know it’s only the Waitrose store on the Sky campus, but it’s a start. We are nation of debit card users. The middle classes rarely carry cash and use it only for paying tradespersons off the books. The Apple Store still accepts cash. The less well off remain trapped in a cash economy that loads costs on to them for no benefits. This is certainly an issue and it demands a national strategy for cash replacement, but as we don’t have one we will see continuing bifurcation as the poor are forced to bear the costs of cash while the rest of us dump it. This is not far-fetched techno-blinkered optimism, by the way. Cashlessness has a toehold and is beginning to spread. Alex Wrethman, owner of the Charlotte’s Group restaurant business, decided to make his most recent opening, W5, an entirely cashless affair. “We are entirely cashless, it’s cards and Apple Pay only. There’s no going to the bank. There’s no cash on site which takes about two and a half hours a day to count. We reduced our insurance as we don’t have cash handling and the opportunity for theft is not there,” he says. Now I suppose this policy might deter the occasional oligarch or drug dealer but I shouldn’t imagine the general public much care, since anyone who can afford to go to the restaurant will have a card, phone, bracelet, hat, badge or whatever. Wrethman is passionate about cashless businesses and believes it is the way forward. He also says most customers “don’t care” as most use their cards or Apple Pay regularly anyway and prefer better prices as a result of cuts in administration. That last point is really telling. As has often been pointed out, as cash usage slowly dwindles, it doesn’t result in much of a saving for retailers. But when cash stops, the retailers can throw away their cash drawers and reconfigure the point of sale, reallocate staff away from dreary reconciliation and cancel the security guards. Reducing cash doesn’t mean big savings, but removing cash does, and without an actual national policy on this, the benefits will go to the middle classes at the expense of the poor. ← “Identity for Blockchain” vs “Blockchain for identity”. What’s in it for Airbnb?